Have you tried Malbec? Did you like it? Which ones are your favourites? From Argentina to France, Malbecs are not all created equal. For me, it was an Argentine Malbec that first piqued my curiosity, leading me to start buying more. I followed that curiosity down to Argentina itself in my second book, Unquenchable: A Tipsy Search for the World’s Best Bargain Bottles. On this episode, in honour of World Malbec Day, I’m taking you with me on a journey to the Bodega Catana Zapata winery in Argentina to chat about all things Malbec and explore why Malbec is a deep, dark, delicious red wine that you need to get to know better. How did Nicolás Catena get started with making Malbec? What was Nicolás Catena’s project on Malbec about? Are there differences between French and Argentine Malbecs? What role did Nicolás Catena’s scientific background play in the development of his Malbec? Do the phenolic compounds in wine offer any health benefits? How do I like to enjoy Malbecs? Today, April 17th is World Malbec Day, so we’re going to chat about why Malbec is a deep, dark, delicious red wine that you need to get to know better. Before we get started, I’d like to give a shout out to Reg Madison, from Brantford, Ontario, who emailed me about episode 18, which was about whether you can still drink wine when you’re on various diets, such as the Keto, Paleo, Gluten-free and so on. In other words, does wine make you fat? If you missed that one, go back and take a listen. I’m so glad that you found that episode helpful Reg — I’m cheering you on that you meet your weight goals and still enjoy a glass of red! I love to share reviews of this podcast for those of you kind enough to post them especially on Apple Podcasts, formerly iTunes, where others can see them. If you want me to mention your website or social media handle, please include that in your review, along with your name. I want to celebrate you and let others know how to connect with you online. In honour of World Malbec Day today, I’m going to share a short passage with you from my second book Unquenchable: A Tipsy Search for the World’s Best Bargain Bottles. You’ll find a link to where you can buy the book online in the show notes at nataliemaclean.com/20. As I drive to the Catena Zapata winery, I recall that one of their wines changed my opinion of Argentine wine: I remember drinking it one night at a friend’s house and guessing that it was Australian Shiraz. My body hummed with contentment as I let myself down into its berry-decadence. I was pleasantly surprised to find out what it was and started buying more malbec. The artistic inspiration for the building came from the ancient Mayan civilization, despite the fact that Mayans never ventured beyond Central America. However, they were great architects, fascinated with mathematical symmetry and the sacred geometry of pyramids. This winery is built according to the same philosophy: every angle at exactly the same inclination toward the sun. Although it looks like a temple of molecular displacement, the beige stone gives it an earthy warmth. I walk up to the top level of the winery, to a quiet study filled with books and big leather chairs. Sunlight streams in through large open windows that look to the Andes. I’m to be granted a rare audience with Dr. Nicolás Catena. As I wait, my stomach flip-flops. I recall thinking how what a coup it would be to interview Argentina’s most brilliant and insightful winemaker. Now I’m wondering how I can carry on a conversation with a man whose IQ is in a range that I’ll never see, except maybe on the bathroom scale. I’m not prepared to defend any thesis to this professor. A few minutes later, the door opens and a silver-haired, bespectacled man enters. He looks every inch the distinguished scholar in a navy corduroy jacket and crisp white shirt. This takes me right back to one-on-one tutorials at Oxford University; I can feel the sweat between my fingers and down my back. His blue eyes radiate from a tanned, weathered face as he greets me in a soft Spanish-accented voice: “Please, call me Nicolás.” As he pours me a glass of his brooding, blackberry-rich Catena Malbec. It was his father who convinced him to consider malbec, which the senior Catena believed to be the country’s patriotic grape, making it in the popular oxidized style that Nicolás calls the “sherry approach to winemaking.” Malbec got no respect in fine wine circles, the stuntman-double of brute strength but no subtlety. Its only role was to beef up the colour, alcohol, and tannin in more aristocratic cabernet blends. “I loved my father very much, so in order to please him, I started a little project on Malbec,” he recalls. That “little project” lasted fifteen years and involved planting 145 Malbec “clones”: the same grape, but from different parent vines, to see which clones would do best in different sites. (“Wine caters to obsessive personalities: it makes you worse,” Nicolás observes with a sigh.) He knew that until the late 1800s, when phylloxera destroyed most European vineyards,Malbecc had been one of the most planted grapes in Bordeaux whereas today, it’s less than ten percent of vineyards there. Ever the scientist, Nicolás narrowed down all those clones to the five best, a process he says that married his bookish and business interests. “As a theoretical economist, I’m trained to develop a hypothesis and then to use a methodical approach to prove or disprove it,” he explains, taking off his glasses and rubbing his eyes. He was aided in this quest by a friend, Bordeaux winemaker Jacques Lurton, who also has wineries in both Chile and Argentina. Lurton convinced Nicolás to plant at higher altitudes, which further improved the grape quality. (“Jacques has a genius for climate.”) In gratitude, Nicolás had a thousand pounds of prime Argentina grass-fed beef delivered to Lurton in Bordeaux. His scientific mind is also engaged with light, studying its effect on the health benefits of red wine. Intense sunlight doesn’t mean hotter temperatures, just more intense rays. The intense ultraviolet light at higher elevations speeds photosynthesis, making it more efficient, so the plants are healthier. It also causes the grape skins to thicken in an attempt to protect themselves from the increased radiation. This accelerates the development of natural compounds, such as polyphenols, flavonoids, and anthocyanins, that give wine its colour, tannin, and flavour. These compounds or phenolics in grapes grown at over fifteen hundred feet are three times higher than in grapes grown at sea level. The result is wine of extraordinary elegance, with a rare combination when young: solid structure and silky texture. Argentine wine isn’t just bottled sunshine; it’s the liquid expression of solar energy. When I drink malbec, I feel voluptuous and expansive—that’s probably why I’m also often wearing my buffet pants with the elasticized waistline. I like to indulge my thirst and my hunger to just this side of plump. I’m tall so I can pack away the pounds without many people noticing. Of course, confessing things like this defeats that notion and will only make me even more self-conscious on the next book tour—if there is a book tour. Perhaps I could do talking head videocasts instead, or maybe I’ll just have to wear the black buffet pants for two weeks. I love how he captures the essence of Malbec. How about you? Have you tried Malbec? Did you like it? Which ones are your favourites? Share that with me please! You can tag me Twitter or Facebook @nataliemaclean, on Instagram I’m @nataliemacleanwine. You’ll find links to my Malbec wine reviews in the show notes at nataliemaclean.com/20. 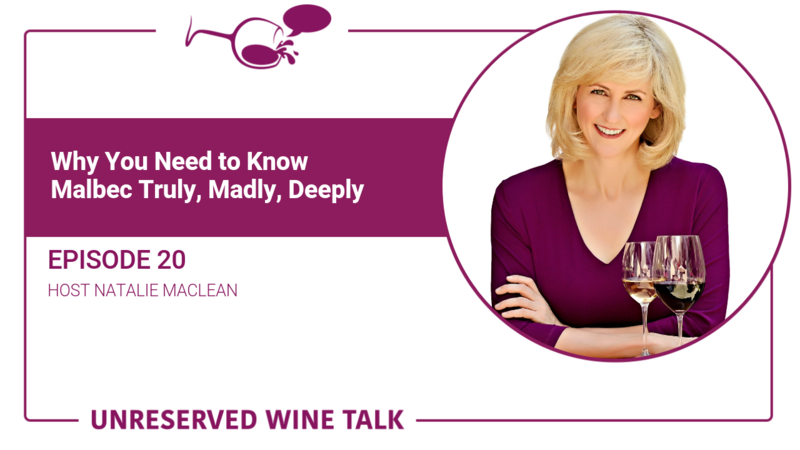 Finally, if you want to take your wine and food pairing to the next level, join me in a free online video class at nataliemaclean.com/class. Thank you for taking the time to listen to this one. I hope something great is in your glass this week!